The Rise and Fall of the Third Reich: A History of Nazi Germany is a book by William L. Shirer chronicling the rise and fall of Nazi Germany from the birth of Adolf Hitler in 1889 to the end of World War II in 1945. It was first published in 1960, by Simon & Schuster in the United States. It was a bestseller in both the United States and Europe, and a critical success outside Germany; in Germany, criticism of the book stimulated sales. The book was feted by journalists, as reflected by its receipt of the National Book Award for non-fiction, but the reception from academic historians was mixed. Rise and Fall is based upon captured Nazi documents, the available diaries of propaganda minister Joseph Goebbels, of General Franz Halder, and of the Italian Foreign Minister Galeazzo Ciano, evidence and testimony from the Nuremberg trials, British Foreign Office reports, and the author's recollection of his six years in Germany (from 1934 to 1940) as a journalist, reporting on Nazi Germany for newspapers, the United Press International (UPI), and CBS Radio—terminated by the Nazi regime's censorship in 1940. The work was written and initially published in four parts, but a larger one-volume edition has become more common. 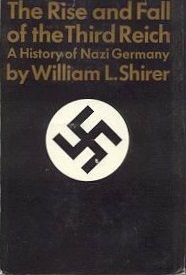 The Rise and Fall of the Third Reich is Shirer's comprehensive historical interpretation of the Nazi era, positing that German history logically proceeded from Martin Luther to Adolf Hitler;[a][page needed] and that Hitler's ascension to power was an expression of German national character, not of totalitarianism as an ideology that was internationally fashionable in the 1930s. The author summarised his perspective: "[T]he course of German history ... made blind obedience to temporal rulers the highest virtue of Germanic man, and put a premium on servility." This reportorial perspective[clarification needed], the Sonderweg (special path or unique course) interpretation of German history, was then common in American scholarship. Yet, despite extensive footnotes and references, some academic critics consider its interpretation of Nazism to be flawed. The book also includes (identified) speculation, such as the theory that SS Chief Heinrich Müller afterward joined the NKVD of the USSR. 35 years after the book's publication, LGBT activist Peter Tatchell criticized Shirer's attitude toward homosexuality, which he repeatedly describes as a perversion, and called for revisions to be made to the book's language and for mention to be made of the persecution of homosexuals in Nazi Germany and the Holocaust. In the philosopher Jon Stewart's anthology The Hegel Myths and Legends (1996), The Rise and Fall of the Third Reich is listed as a work that has propagated "myths" about the philosopher Georg Wilhelm Friedrich Hegel. In 2004 the historian Richard J. Evans, author of The Third Reich Trilogy (2003–2008), conceded that Rise and Fall is a "readable general history of Nazi Germany" and that "there are good reasons for [its] success." Evans contended that Shirer worked outside of the academic mainstream and that Shirer's account was not informed by the historical scholarship of the time. ^ "Books Published Today". The New York Times: 26. October 17, 1960. ^ a b "National Book Awards – 1961". National Book Foundation. Retrieved 2012-02-20. ^ Evans 2004, p. xvi. ^ Rosenfeld 1994, p. 102. ^ Rosenfeld 1994, pp. 101–02. ^ Evans 2004, p. xxiv. ^ Rosenfeld 1994, p. 106. ^ a b Rosenfeld 1994, p. 101. ^ Cedar Rapids Gazette, 9 October 1960, p. 47. ^ Rosenfeld 1994, pp. 100–01. ^ William L. Shirer (1990). The Rise and Fall of the Third Reich (3rd ed.). New York: Simon & Schuster. p. 1146. ^ Rosenfeld 1994, p. 96. ^ a b Epstein 1961, p. 230. ^ Rosenfeld 1994, pp. 95–96, 98. ^ Wiskemann 1961, pp. 234–35. ^ Stewart, Jon, ed. (1996). The Hegel Myths and Legends. Evanston, Illinois: Northwestern University Press. p. 383. ISBN 0-8101-1301-5. ^ Evans 2004, pp. xvi–xvii. Shanahan, William O. ([https://query.nytimes.com/gst/fullpage.html?res=9C0CEEDB1730F932A25751C1A966958260 Obituary) The American Historical Review, Vol. 68, No. 1. (October 1962). Rosenfeld, Gavriel D (January 1994), "The reception of William L. Shirer's 'The Rise and Fall of the Third Reich' in the United States and West Germany, 1960–62", Journal of Contemporary History, 29 (1), pp. 95–128, JSTOR 260957 . This page was last edited on 21 March 2019, at 05:46 (UTC).